It was only a few months ago that we got around to looking at the AMD Radeon R9 280, a rework of the HD 7950 with Boost. However, today AMD is effectively replacing it outright with the new Radeon R9 285. As such, you can expect some good deals on the outgoing R9 280 as retailers make moves to clear stock. The R9 285 is built for 1080p and 1440p gaming with maximum or high settings, and the card updates the R9 280 series with the latest Graphics Core Next and AMD technologies, many of which are found in the Hawaii-based R9 290 series. As with the R9 280, AMD is pitching the R9 285 against Nvidia's GeForce GTX 760. As such, the £170 (or thereabouts) price tag for the R9 285 makes sense – Nvidia's card costs the same, although a handful can be found for £160. The R9 285 also marks the introduction of a new 28nm GCN GPU called Tonga. Like the Tahiti Pro2 chip in the R9 280, it has 28 compute units for a total of 1,792 stream process and 112 texture units. However, the layout has been redesigned for greater parallelism, with the CUs now split between four shader engines, each with its own geometry processor and rasteriser. This is the same layout as Hawaii, and it gives Tonga better tessellation and geometry processing than Tahiti, which only has two geometry processors. We also find eight asynchronous compute engines at the front end instead of two for great compute performance. There are also two render back end units per shader engine, so the R9 285 maintains the R9 280's 32 ROPs. The GPU has a stock frequency of 918MHz, a slight drop from the 933MHz of the R9 280. The memory controller count has been reduced from six to four, giving Tonga a 256-bit interface. This reduction is most likely a result of AMD wanting or needing to keep the memory controller count in line with the scaler engine count. Having six would require them to be shared between shader engines unevenly, which is harder to optimise for. 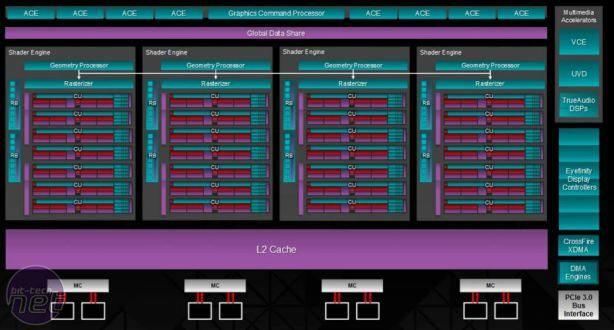 The onboard memory has also been reduced, from 3GB to 2GB of GDDR5, though AMD says 4GB SKUs will also be available. Again, this is likely a result of AMD wanting Tonga to have a power of two design at the high level. The memory is clocked at 5.5GHz, so the card has a total memory bandwidth of 176GB/sec. AMD refers to the R9 285 as having third generation GCN technology, as it comes with a number of hardware-level improvements. For example, it's now using lossless compression for colour data in the frame buffer, which it claims results in a far more efficient use of the memory bandwidth, which helps to negate the impact of it being cut by over a quarter. The instruction set has also been updated, with benefits to be felt mostly in the areas of low power GPU compute and media processing. The Eyefinity display controllers, UVD (unified video decoder) and VCE (video coding engine) have also received upgrades. The UVD now supports high framerate 4K H.264 content, alleviating CPU load when such content is played, while the VCE is now faster when it comes to transcoding video, and again supports 4K resolutions. Tonga is also equipped with the latest CrossFire XDMA controller. 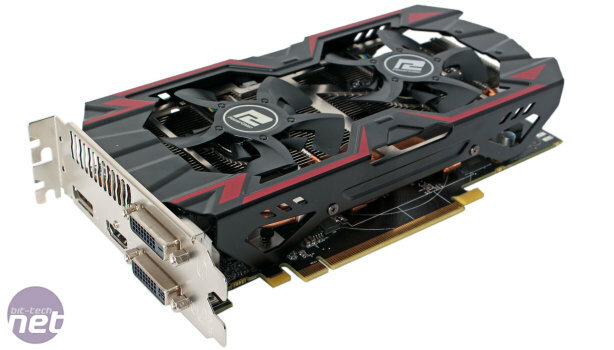 As with the Hawaii-based R9 290 cards, this allows CrossFire to run solely over the PCI-E lanes without the need for an external connection. The R9 285 supports a host of AMD's latest audio and display technologies. The TrueAudio DSP is included, enabling enhanced audio processing in games and software that support it. The Mantle API is of course supported too, as is FreeSync, AMD's answer to Nvidia's G-Sync, and a technology which aims to eliminate tearing and stutter in games. PowerTune is used to adjust frequency and voltage in real-time to keep the card performing as best as possible within its power and temperature limitations, while ZeroCore can disable unused GPUs entirely in a CrossFire configuration for lower idle power consumption. 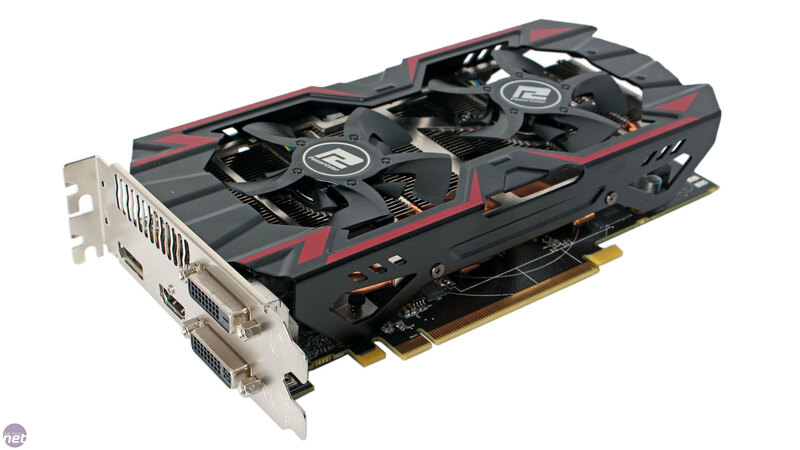 As with the R9 280, power is drawn through two 6-pin PCI-E power connectors and the board as a typical board power (AMD's version of TDP) of 190W, 10W lower than the R9 280, suggesting a few efficiency tweaks have been applied. 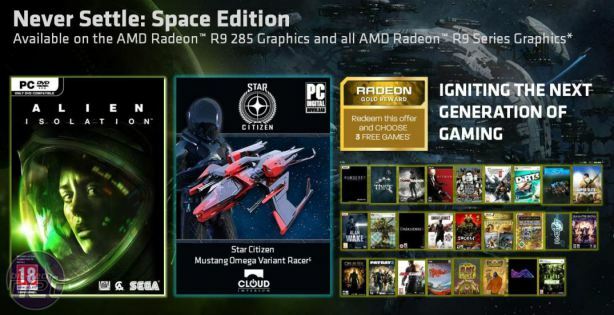 Today also marks the launch of AMD's Never Settle: Space Edition, which introduces Star Citizen, Alien: Isolation, Habitat and Space Run to the seemingly ever expanding catalogue of games that users can select from. The R9 285 qualifies as a Never Settle Gold level product, granting anyone who purchases it from a participating retailer a code that is valid for three game choices. Anyone with unused Gold or Silver coupons can upgrade to the Never Settle: Space Edition promotion, provided they redeem their ticket between today and Monday September 8th. Continuing its trend of late, AMD doesn't actually appear to be sampling reference R9 285 boards (perhaps the dire performance of the R9 290(X) cooler called for a change in strategy here), so we've instead been furnished with a Powercolor model. Its specifications are the same, but naturally it has a custom cooler, so we can't get reference temperature results. It also has a token factory overclock of 3 percent, allowing it to run at 945MHz instead of the default 918MHz. Though it won't make a lot of difference, we'll be testing at both speeds, as it's important to establish baseline performance for each card. The Powercolor card has no factory overclock for the memory. 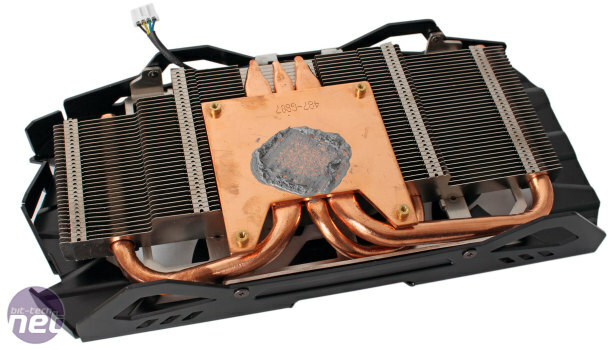 Powercolor's cooler thankfully doesn't extend the length of the card or make it occupy more than two slots. It features two 5-blade downdraft fans that will exhaust most of their air back into your chassis. 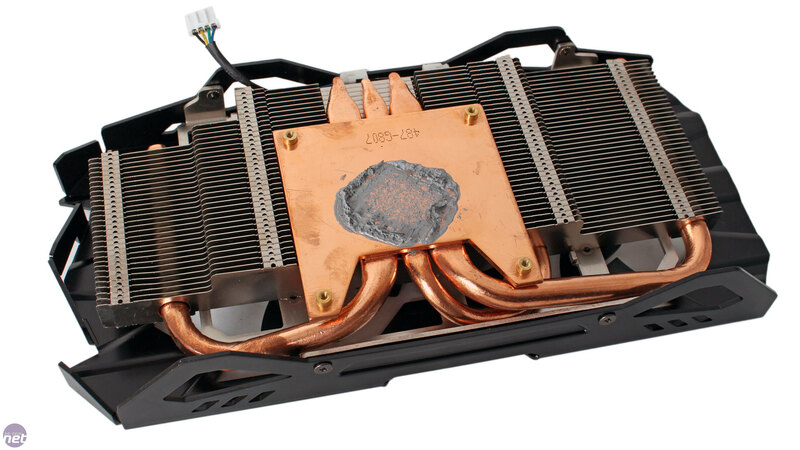 The heatsink has a large copper baseplate for the GPU and transfers heat to the single fin stack via three copper heat pipes. There is no direct memory cooling. Looking at the PCB we see that, unlike the memory, the five main power phases are directly cooled by a small, separate heatsink. Powercolor is using 2GB Elpida memory chips rated for 6Gbps, so there should be some good overclocking headroom provided the memory controllers can handle it. A single 4-pin fan header controls the speed of both fans together. No agency involvement, company claims.